It is really simple to find high ended Reconditioned Engines for your car. All you need to do is enter your car registration details and we will do the rest. You can get the most suitable engine prices from our large network of reputable recon engine suppliers. 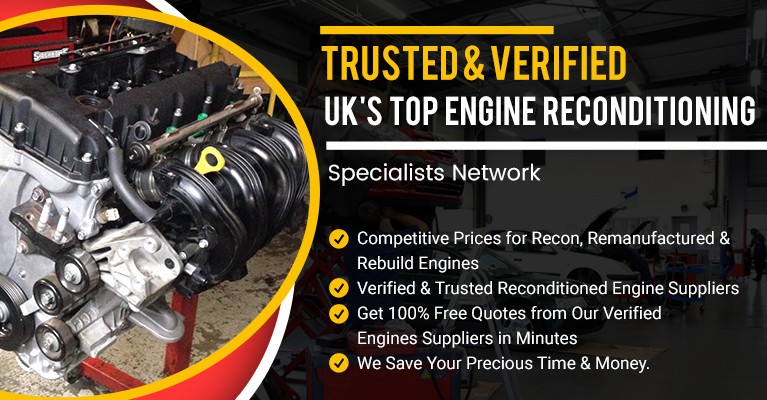 Follow just 4 simple steps to get the very best reconditioned engine deal on the net. All of the reconditioned engine suppliers in our network are certified by our quality control team. Right now place your order to receive the best engine that you want. Fast and simple engine price quotes are available completely free of cost. There is no hidden cost for using our service. Actually, you have it 100% Free of charge to use. We charge only the small amount of service charges from our network members to maintain the operations expenses. Your order is placed now for the engine which you selected, the engine supplier will certainly send you engine delivery day and time which is mostly fast.